Frosty was born November 18, 1938 to Charles and Ula White of Paradise, KS. He is predeceased by his wife, Judy Berniece Hubbard White of Kansas City, KS, his parents, brothers Ivan and Dale White and sister, Violet Parsons, and son-in-law, Paul Hurley. He is survived by sister, Garnet Angel of Olathe and Vernon "Doc" White of Wichita, Trudy Hurley of Shawnee and Stasha Case of Olathe, Stasha's husband Bill Case, and granddaughter Lauryn Hurley. 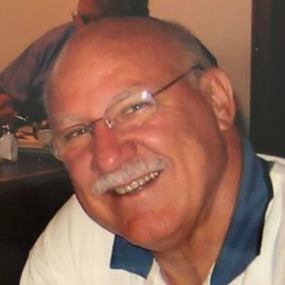 Services will take place on Saturday, March 23rd at 1:00 pm in the Wesley Covenant Chapel at the Church of the Resurrection, 13720 Roe Ave., Leawood, KS 66224. A social reception will take place at Coach’s, 9089 W. 135th St, Overland Park, following the service. Charitable donations can be made to The Theatre in the Park, Johnson County Arts & Heritage Center, 8788 Metcalf Ave., Overland Park, KS 66212 or online at www.theatreinthepark.org/donate-online-now. The youngest of 6 children, Frosty grew up in Paradise, a small farming community in western Kansas, which he truly considered the most beautiful place on Earth. He attended Paradise Methodist Church and sang with the choir there. After graduating in a class of 12 from Paradise High School, he spent a year at Hope College then returned to Kansas to attend Kansas State University and study Mathematics. While at KSU he was active in his fraternity, Delta Upsilon, and with the K-State Singers. His time spent with the K-State Singers included a USO Tour to perform in Korea. He also met his wife, Judy, while at K-State. Upon graduating, Frosty and Judy moved to Torrance, CA where Frosty taught math at West High School while Judy finished her teaching degree at Long Beach State. Once that was accomplished, they sold everything, including the small trailer they lived in, and traveled to Germany to teach school on a US Army base. They took the opportunities afforded by school breaks to travel all throughout Europe. After one year, Frosty was offered the chance to study computer science and programming at the University of Hawaii at Manoa. Judy taught school while Frosty studied. He spent a year completing his training in Hawaii and in 1966, with Judy pregnant with eldest daughter, Trudy, they returned to settle down in Overland Park. Stasha was born 16 months after Trudy. Frosty worked for IBM for several years, travelling around the country and working with companies to improve their cyber security in the pioneering days of computing. He left IBM for a job that didn’t require so much travel in the computing department of Gay Gibson, one of the many KC garment labels that once thrived here. He eventually started his own company, writing computer programs for small businesses and selling Data General computers. He ended his career working for Sprint. While his girls were growing up, Frosty was the family breadwinner while Judy was the homemaker. He knew what boys like to do but was unprepared for little girls! The first activity was a group called Indian Princesses, a father daughter scouting-type group that now would be considered an inappropriate cultural mis-appropriation. Stasha's Indian Princess name was White Feather, Trudy was Silver Feather and Frosty was Bald Eagle. We thought we were so clever. Our next adventure was softball. The girls played for 8 years with Frosty serving as an assistant coach. Since neither Trudy or Stasha were particularly athletic, in junior high they rebelled. Trudy announced she was trying out for Theatre in the Park in Shawnee Mission Park that summer. With Frosty's singing background at K-State, he decided this would be a fine change. He and Stasha ended up auditioning as well and all three were cast in The Music Man in 1982. Frosty ended up performing in at least one show per summer until 2009 and then a couple more thereafter. He was often joined by his daughters. Twice they were able to convince Judy to join them. The family met and became friends with Stasha's future husband, Bill Case, through Park shows. Bill eventually ended up working for and with Frosty in the computer business and at Sprint. When granddaughter Lauryn came along, she joined the "family business" as soon as she was able. Frosty, Trudy, Stasha and Lauryn performed together in 4 productions. He could not have loved his family more or been prouder of them. After Judy passed away in 2004, Frosty was fortunate to find love again with Vonnye Sue Small whom he met through mutual friends. They spent many happy years together, living together in Overland Park and Houston, TX. He was an active member of the Church of the Resurrection and volunteered for some of their outreach ministries. A member of COR choir, he took great pleasure in the opportunity to sing and enjoy the camaraderie of all the members. Frosty was the friendliest man in the world. There is no hyperbole in that sentence. He truly never met a stranger. He was generous with his time and money to friends and acquaintances. He will be missed by his family and the many, many lives he has touched. Frosty has been a force in my life since the 1980’s, when I meet him (and Trudy and Stasha) at—where else?—Theater in the Park. I recall pool parties at their home, and just hours and hours of fun and laughter. Frosty’s love for life was contagious, and his booming voice and hearty laugh touched anyone who knew him. He never failed to ask about my sons, or to regale me with a memory of shows we had done together. I will miss him dearly. As an adult, I have had the pleasure of appearing in shows with Stasha, Trudy, and Lauryn, whom I consider dear, dear friends. Ladies, I am sending you all my love right now; I hope you can feel it. I only knew Frosty for a few years, but he never failed to bring a laugh to the table. We'll miss you, brother!